Pure Integrity Soy Candles produces beautifully strong, realistic scents! Our Innovative Fragrances are another reason we are told over and over again that Pure Integrity Soy Candles are the best scented candle. Fragrances can have an extremely powerful impact on your mood and even behavior. I (Jeff) remember learning about our olfactory system in one of my lower level Psychology classes and it intrigued me that our sense of smell can often stimulate more brain activity than our other senses. But what makes our fragrances better? A simple answer would be, “Our raw materials.” But that would be an over simplification. Everything matters, the quality of the raw materials, the process for making each raw material, the process for making each candle, etc. The details of every process matter, such as temperature, time, solvents used in any extraction process and so on. We could write a book in this section, but it would be dry, dry, dry . . . So here is a little detail without getting too technical. Our early attempts at making candles included scents from essential oils, floral essences, natural extracts and even synthetic compounds. We faced many different challenges with each approach. We quickly abandoned using 100% synthetic fragrances because we could not figure out the safety of many ingredients. Not only was there very little safety data at that time, but most ingredients did NOT have to be disclosed by the fragrance manufacturers because of proprietary secrets/protection; this is still true today. 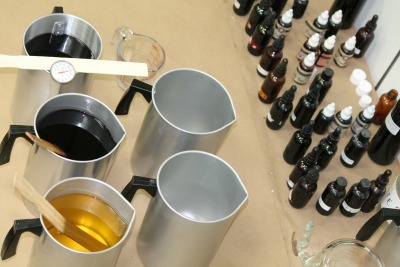 After attempting synthetic fragrances, we turned to using all natural fragrances. However, this also quickly proved to be far from a perfect solution. Most of these natural ingredients struggled to burn properly or had little scent-throw. One of our first breakthroughs was to use soybean oil as a solvent/carrier for our fragrance. Typical fragrances use petroleum derived carriers which we wanted to avoid. This new carrier allowed our candle to be more natural and also to be more compatible with soy wax. We started isolating the good characteristics from each raw material and avoiding the bad. For example, when you burn most citrus oils they produce a substantial amount of smoke and a bad smell. Many citrus oils have very low flash points and are too acidic to burn well. Some natural oils burn so poorly they are harmful to breathe when burning. Other essential oils can be toxic to individuals that are pregnant, nursing, or have varying other reasons for sensitivity. In many cases we learned to use an organic isolated chemical compound (i.e. citrus isolate) bonded with a stable healthy synthetic organic compound to create a healthier and better smelling fragrance. Being a purist, I would no longer consider this 100% natural; however, it is definitely healthier and better smelling! At this point, we knew we were onto something big. Most synthetic materials are quite different from their natural counterparts, which can be good or bad. However, there are some synthetics that are chemically identical. Meaning they look and function in identical ways and are identical even under the closest observation, they are even issued the exact same Chemical Abstract Service (CAS) number. For example, if you were able to bond 2 parts Hydrogen and 1 part Oxygen you would create water. Even though it did not occur naturally, it is still water. We work very closely with our raw material producers to make sure that every ingredient in our products meets our highest standards. We have learned who to trust by taking nothing for granted. Here is a recent example, when testing a new supplier�s “chemically identical” Cinnamic Aldehyde, which is the isolate that gives Cinnamon its scent, we notice that the flash point was off by almost 50 degrees. Obviously this was not a chemically identical raw material. Needless to say, that supplier did not win our business. Fourteen years ago when we were first working on our formulations there was almost no legislation in the candle/fragrance industry. However, we didn’t need the government to tell us what was healthy or unhealthy, we did our own homework. About the only law at that time in the candle industry was the illegality to use lead in the wicks. What a shock, we already knew that was a bad idea and so did most candle manufacturers. Our research lead us to avoid many ingredients, including some naturally occurring materials and many synthetic compounds. In the past few years the government has started to ban some of the raw materials that we have been warning customers about for over a decade. It is important for us to earn your trust by doing what is right for you and your family. We believe that Pure Integrity is the best scented healthy candle on the market and promise to continue making advancements way beyond industry standards. Part of our promise to you, is that we will never use any phthalate and will exceed the most stringent environmental standards, including California Proposition 65. You can feel good about burning the same soy candles we invented for our own family. And of course, enjoy how strong and realistic our fragrances smell. Say goodbye to the hole burning down the center and all that wasted wax on the sides of the jar. Pure Integrity Soy Candles burn beautifully even and clean. Our candles out-perform other candles with scent-throw, but also in terms of burning quality. Because soy wax burns 20 degrees cooler it is even more difficult to achieve an even and proper burning candle. Our solution is rather simple: it just required major patience, determination, and A LOT of testing, in addition to the properly formulated fragrances discussed above. Since the creation of soy wax there have been many advances in wick technology. There are literally thousands of wicks available and each one has its benefits and challenges. Even with all the options available, many “normal” size jars did not burn properly. We realized that using a very large wick for this size candle created an unclean burn and found the ideal solution was to use 2 smaller wick. Many of our larger candles use a double wick for this reason. By choosing the proper thickness and design of the wick it enables the wick to pull the wax up and throw scent into the air, creating a greater scent throw! 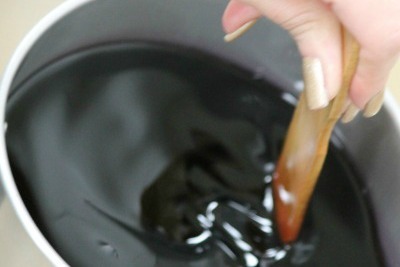 The wick also has to be strong enough to create a large enough melt pool of melted wax to extend out to the edge of the jar, while still burning slowly enough to maintain a longer burn time. The wicks also have to be rigid enough to hold themselves in place, staying above the wax. We test hundreds and hundreds of wicks to be sure each different fragrance and size burns properly. Patience and determination pay off and we continue to perfect the wick size for our unique soy wax formulation. Believe it or not, some of the large nationally known candle companies are using the wrong size wicks and you have probably experienced some of these poorly burning candles. You are going to love Pure Integrity Soy Candles! Just read our scented candle reviews! There is not a better smelling, better performing healthy candle! But don't take our word for it - experience our exceptionally strong scented soy candles today for yourself! You will be so glad you did!